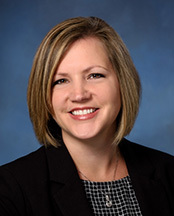 Jenna Bickford is a partner in the Business Transactions Group of MacDonald Illig. She represents clients across a number of practice areas including Business Transactions, Real Estate, Government Services and Public Finance, and Health Care. Ms. Bickford routinely represents business clients of all sizes with a variety of legal needs including business formation, contract matters, corporate and regulatory compliance, and mergers and acquisitions. She has also taught mergers and acquisitions as an adjunct instructor at Mercyhurst University. As a member of the Real Estate Group, she regularly handles both residential and commercial real estate transactions and assists clients with title matters. She also represents clients in commercial lending transactions, municipal finance transactions, and various other types of financing transactions. Ms. Bickford counsels health care providers on contract matters and matters of regulatory compliance including, among others, HIPAA, Stark and Anti-Kickback matters. She also represents providers in government payment rate appeals. Ms. Bickford oversees the firm's summer clerk program and is a member of the recruitment and library committees. During law school, Ms. Bickford was an Executive Editor of the Journal of Law and Commerce. She was also a teaching assistant for the Legal Writing Program.